From the front of class, I could see all the kids. This was my view all morning at school. Juf Neenke put a magnet on my belly so I could see the kids and the school day's schedule. Dutch kids do not go to school on Wednesday and Friday after lunch. We could go home at 12:30. What did I learn today? It's on the board above my head. 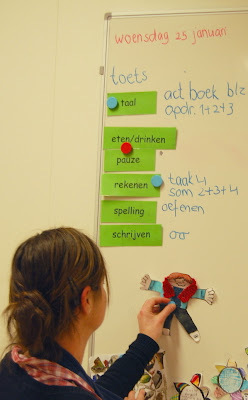 Type in the Dutch words on the green paper to see what I learned today. Click on the picture and make it bigger. The students in this school also get lessons about Respect, Responsibility, and Working Together. They learn how to understand their own feelings and to respect the feelings of their classmates. Instead of fighting, shouting or bullying, these 2nd graders know how to communicate with each other to solve conflicts. They are taught that they always have a choice. They can decide how to solve things. I felt very safe with my new friends.